Students read the book "Monsters Don't Eat Broccoli" by Barbara Jean Hicks. We then talked about texture (how things feel) and what kinds of textures the monsters they would make would have. They then made crayon rubbings by putting paper over a texture plate and rubbing the paper with the side of a crayon. When they filled the whole sheet, students were given their VHS cover to turn into a monster. With some populations, you may choose to have pre-cut features, but my particular students were capable of making their own. We used foam dots instead of glue for less mess, but you could use hot glue if you feel comfortable doing so and don't have too many students. Students attached foam and pipe cleaner pieces to their VHS cover, and drew on additional details with Sharpie. 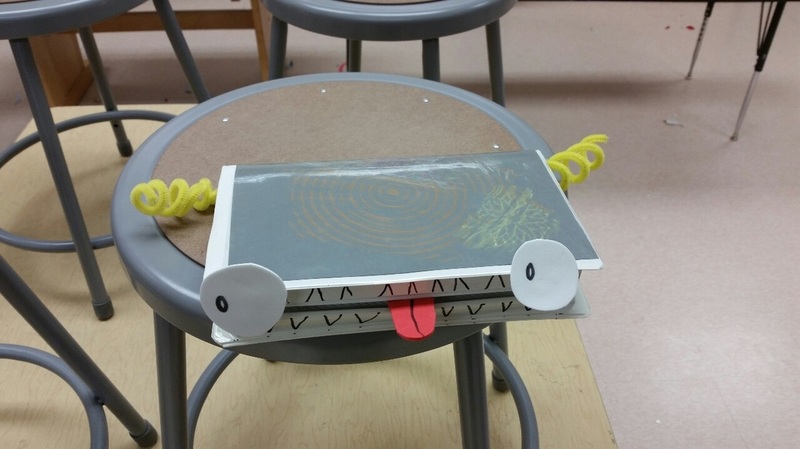 Some got creative and even made fingers and toes for their monsters! Students then made food for their monsters to eat out of Model Magic and put the food in the monsters' mouths and kept their food creations in the box. PS- students have nooo clue what VHS tapes are.